Looks like we're down to Left 3 Dead now: One of the original quartet of Survivors - Bill, Louis, Francis and Zoey - won't make it to the DLC. If you care about spoilers, time to leave this topic. Like, right now. Okay, consider yourselves warned. Valve has had a knack for wordplay and double meanings when it comes to the titles of the Left 4 Dead campaigns, and it turns out that The Passing is no exception. While on the surface the name would seem to refer to the chance passing encounter between the Left 4 Dead Survivors and the Left 4 Dead 2 cast - and it does - it also carries a far more sobering connotation: Someone ain't making it through alive. 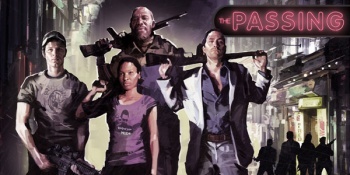 The tagline for The Passing is "No One Survives Forever," and as L4D writer Chet Faliszek told GameTrailers, by the time the Left 4 Dead 2 zombie-crunchers run into the group from the first game, that quartet will be down to three. Interestingly enough, the death will play out in two ways. There will be a section in the upcoming L4D1 DLC (bridging the gap to explain how the cast got down South to meet with the other four for The Passing) where one of the players must sacrifice themselves in order to proceed. We're not talking about the sort of moment where you stay behind to cover your injured teammate as they hobble towards the boat on Hard Rain and get clobbered by a Tank, either - this is a 100% required death. However, the players will be able to decide who dies and who lives as far as the playthrough is concerned. There will be a canon version of the death, however, as illustrated in a comic book - this is the "idealized version of how it works out," according to Faliszek. Now, the only question is: Which of the foursome will be making their last stand? Is it the old veteran Bill, weary of life and ready to give the younger generation a chance? Is it Louis - thanks to the long and proud tradition where the black guy always dies? Is it Francis, who admits to the other three, "Y'know, I don't hate you guys" before riding off in a blaze of glory? Or is it Z--okay, let's be honest here. It's not going to be Zoey, and we all know it. I guess we'll just have to wait and see. Let's hope Valve gives them a true Dying Moment of Awesome.